Theresa is a lifelong member of the parish and an alumnus of Immaculate Conception School. 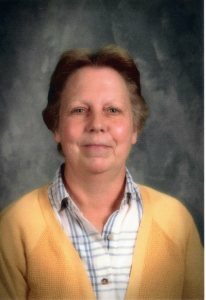 December, 2016 will mark 20 years for her as an employee of the church and school. Theresa's duties as Liturgical Coordinator include scheduling weekend and daily Masses, keeping the mass intentions schedule, maintaining the sacramental registers, preparing sacramental forms and certificates, coordinating funerals with the music ministers and cemetery staff, preparing schedules for First Friday Communion Calls, preparing and distributing the liturgical ministry schedules, aiding Father Monty in coordinating the setup for Confirmation, First Eucharist, and Confirmation, assisting with weddings, ordering church supplies, and making sure the interior and exterior of church is maintained and beautiful, especially for Christmas and Easter.